In Music We Trust - Mankind Liberation Front: Isolated re-mixes 12"
Herwig Maurer (aka Smack 3000) and Ran Pink (aka Breathe), from hereon known as Mankind Liberation Front, follow up their RCA Records debut with a 12" remix on the West Coast dance label City of Angeles. If you've heard their alien-conspiracy filled, manic dance groove, wicked electronic beat sound before, you know what you're in for with this. And, if you haven't heard the band before, all the more reason to check out this big slab of vinyl. 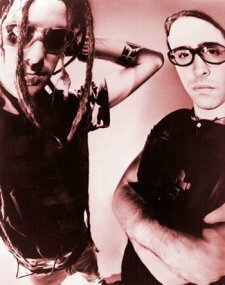 The A-side includes the manic dance vibe of the Lunatic Calm Mix while the B-side thumps away with the ultra-bass of the Joshua Ryan Mix and the original version off of their debut record, MANKIND LIBERATION FRONT (RCA Records). One listen to each song -- or just the first few minutes of one side -- will find you grooving along to this tremendously infectious, unstoppable dance party. Even as I write this, the music is blaring from my record player, and I can't keep still. The bass is amazingly heavy while still keeping the electronica groove nice and tight, and the music packs a tight wallop that is hard to ignore, unless you're dancing and letting the music flow throughout your body. Their music is ingeniously designed to make you want to dance, dance, and dance. And, this 12" is a perfect example of what they're capable of. Good thing this isn't on CD, I don't think a CD could pack this much juice; this is not just MLF at their best, but this is vinyl at its best. I'll give it an A-.